Most people assume that getting healthy involves only diet and exercise. The truth is, health is rooted much deeper than what you see on the surface. In today’s fast paced technological world, we are inundated with distractions that are often beyond our control. Developing a consistent daily meditation practice is one way to help us cope with life’s stresses in addition to other ailments we might have. For years, practitioners have researched, written about, and analyzed the positive benefits of practicing daily meditation. Mindful meditation is proven to ease psychological stress, anxiety and depression, and can also help you sleep better, improve brain functionality, reduce aging, and allow you to feel more connected in your surroundings. The health benefits of meditation don’t stop there. Some additional physical benefits include lowering high blood pressure, decreasing tension-related pain — such as, headaches, ulcers, insomnia, muscle and joint problems — increasing serotonin production, and improving the immune system. Schedule meditation time into your day; just like if you were attending a business meeting, going grocery shopping or picking up your child from school. You have to prepare for your meditation just like any task and make it a part of your routine. It may even be helpful to write it into your calendar like you would any other event. Due to unexpected events, there are times when we have to reschedule appointments. Follow suit when it comes to your meditation practice. It doesn’t matter what time of day you practice, or even the length. Focus on setting aside at least 10 minutes or more of undisturbed time. You can practice meditation from anywhere, so don’t get too hung up on the specific spot. If you do, you may start to find yourself making excuses on why you shouldn’t meditate. Meditation is not about perfection but it is about consistency. Wherever you are when you schedule your meditation time, try to find a quiet spot nearby. This could be outdoors on your patio, in your living room, or in a corner of your office at work. Even if the spot does not provide the quietest environment that is okay. Your goal is to quiet your mind. Focus on your breathing to control the noise that may surround you. You’ll see that many experts recommend longer periods of meditation for the greatest benefits, somewhere between 10 and 40 minutes a day. But, for a new beginner, 10 minutes may be overkill. When you are just starting to establish a daily meditation practice, set a small and easily achievable goal for you to meet every day. As you make meditation part of your routine, you can then extend that amount of time until you reach the time limit that is best for you. Think of your breath as your guide as you start to engage in meditation. As you begin your meditation, take a few deep breaths in to allow your mind to ease into a peaceful state. Explore alternative styles of breathing such as nadi shodhan pranayama, an alternate nostril breathing technique, or ujjayi breathing, a victorious type of breath that consists of a gentle breath that is both relaxed and energized. While establishing your practice you may find your mind starting to wander, or you may find it difficult to get comfortable. It is easy to get sidetracked by responsibilities and external influences. The moment you feel yourself slipping into a distracted mode, mindfully bring yourself back to center. In order to calm your mind and body focus again on your breath. With each breath let go of the senses that may be most distracting. Then allow your body to fall into relaxation. The best way to experience all of the benefits of meditation is to start practicing it more regularly. By setting the scene, preparing your body and focusing on your breath, you can open your mind and body to all the health benefits of mediation. Do you meditate daily? 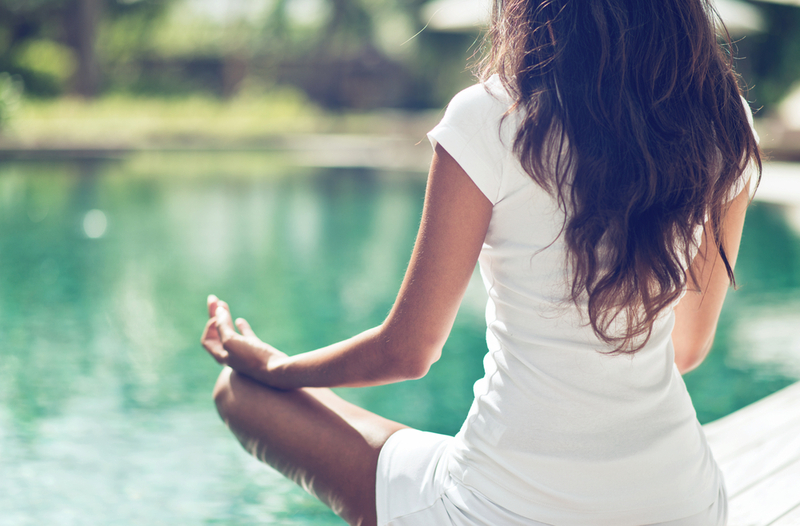 Have you seen any benefits from regular meditation? Let us know in the comments! This entry was posted in News and tagged Health, Meditation. Bookmark the permalink.